An anonymous artist has been leaving delicate paper sculptures made from old books at locations in Edinburgh and around Scotland for more than three years. The identity of the woman has remained secret despite the international attention that the book sculptures have received. BBC Scotland's arts correspondent Pauline McLean conducted an interview with her - via email to maintain her anonymity. Question: Why did you start making the sculptures? Answer: The first book sculpture, a little tree for The Scottish Poetry Library, was made primarily as a response to library closures and cutbacks. But it was also as a bit of fun for the library staff who, throughout Scotland, the UK and much further afield, provide a service in straitened times - above and beyond. It was a poor attempt to illustrate the notion that a book is more than just a book - and a library is a special kind of building. It's no secret that I would like everyone to have access to books, art, artefacts and the buildings that house them. Not just those with the money for a ticket. I think it's true that the immediate way we can and do now access information has altered things. But it remains important to have expert help, to see things for real, to have buildings set aside that inspire and make expectations of us and that anyone can enter. Question: You placed the sculptures in specific locations - and some of them weren't discovered immediately - was that part of the plan? Did you worry when a work wasn't found immediately? Answer: I didn't have a plan when I left the pieces. I chose places I love. I made works that I thought suited them, added tags with what I suppose is my mission statement: "In support of libraries, books, words and ideas" and placed them in situ. That to me was the end. What happens next always was, and is, down to others. That some were found immediately, others a while later, that they may never be found, or be immediately binned, has never been a problem to me. It was something I wanted to do, a shout-out I wanted to make. The book sculptures were there I suppose to make you read the tag. Image caption The words read: "Nothing beats a nice cup of tea (or coffee) and a really good BOOK"
Answer: Why would you focus on one ordinary individual? Libraries, galleries, museums etc are a better focus and a lot less ordinary. Question: Has it been hard to keep your identity secret? Answer: No, it's not been hard to keep the secret. Those that know me are like-minded. Image caption This Tam O' Shanter-inspired sculpture was left in the Robert Burns Birthplace Museum. Question: You gave some clues "a woman, who had been a girl, whose life would have been less rich had she been unable to wander freely into libraries, art galleries and museums" - do you think your work has raised awareness of the need to support these institutions? Answer: I like to think the sculptures have served their purpose in some small way but I do worry that they overly draw attention to themselves as objects. My intention was never that they be viewed as artworks or even that they would last. They are, after all, made from clapped-out old books. The end for me though was in leaving them. Once a gift is given it is in the hands of another. Image caption This work was inspired by Compton Mackenzie's Whisky Galore. Question: You agreed to a commission from the Scottish Book Trust in 2012 - why? Has anyone else tried to commission work? Answer: The Scottish Book Trust asked, their idea was good. It was the first Book Week Scotland. I did offer to waive my fee but they insisted on paying, which was lovely of them. I did wrestle with it though and in the end used the fee for the five they commissioned to buy me time to make the 30 book-birds which I left the next year at Edinburgh Book festival. Question: Is your most recent sculpture - Butterflies - your last? 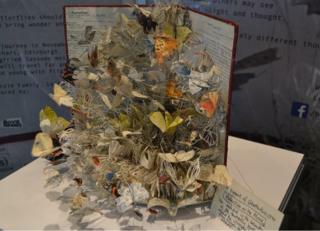 Answer: What makes you think "Butterflies' is my most recent sculpture? The Butterflies sculpture was designed as a fundraiser for Macmillan Cancer and sold in August at auction. It was bought by the Mackenzie family, owners of Hi-Fi Corner and the Movie Rooms. Colin Mackenzie told BBC Scotland the "intricacy and the detail of the work is enormous". He said: "It has inspired me and I'm sure it has inspired lots of others as well." Mr Mackenzie has decided to tour the sculpture. He said: "I don't see the point of buying something so interesting and just keeping it in a glass case in the house. So I thought it would be really interesting to take it round the country." "Most of these sculptures can be seen in Edinburgh and I think it is better that we get it away." The butterflies sculpture is currently on display in the reception area of the BBC Scotland headquarters at Pacific Quay in Glasgow, where it will remain until mid-February. It will then tour around the country, visiting Stromness library on Orkney, Aberdeen library and Abbotsford in the Borders. Mr McKenzie said he was open to offer to other venues for the tour. More details are available on the Facebook page.